Question: Why is the upcoming women’s convention called “One Global Woman”? What does “global woman” mean? Answer: There is only one soul in the world, a unified desire that was split into two complementary parts: male and female. They, in turn, were broken into a huge number of individual desires. Our job is to gather the female and male parts together. At the same time, they rise above their routine earthly desires, correcting the desire to receive to the desire to bestow, and then two desires emerge that, on the one hand, are opposite, but on the other hand, are spiritual. 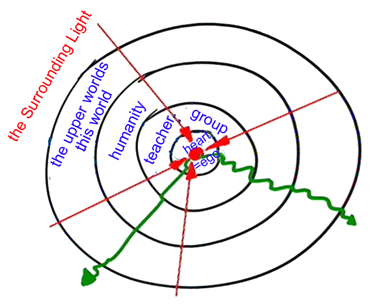 And then both parts begin to connect with each other into one unified, common creation that is called Adam. In principle, this is what we have to do. Men will gather at their convention a week after the women’s convention. And before that, we will discuss with the women how it is possible to unite into one unified women’s desire. I hope that we will succeed. At least, this is very important for the men and for all of us. We have never done this before, and now the time has come. I never do anything in advance. When there is a need to realize the next state, I talk about this and then we begin to think about how to implement it. Now we have come to the state when we really need to get together and try to unite into a single woman’s desire. I congratulate all the women in the world with our great internal holiday. We will try to make it important, light, serious, and at the same time fun! Question: How can I correctly prepare for the women’s convention? Answer: First, we should review the materials that relate to women’s work. Basically, in our time, there is not much difference between men’s and women’s work because a gradual convergence is taking place. We see how the women of the world occupy leadership positions, are heads of state, ministers, and managers of various companies. Today, they are equally involved with men in all the spheres of activity. Although women are inherently more inclined to something specific, standard, stable, and not the activities that constantly demand drastic changes, the time has come when both desires—male and female—come together in our world and in the spiritual world. This occurs in accordance with the spiritual roots, and thus it is necessary to think how to bring them together even closer. This is what we are going to be engaged in at the convention: The women must understand the goal before them. Never before have women become united together. We had all sorts of attempts to unite in groups, during general conventions, but there wasn’t such a convention to make the desire of all the women as one woman’s desire, to create a unified image of women’s desire. That is why the preparation for the convention is to think more about it, read, clarify the questions on this topic, and upload all the questions and answers on the website. The most important thing is to be in a good mood, good spirit. Those who come here will inevitably enter this atmosphere. Those who will be connected to us should be prepared to get into it: They should be free of all their activities and feel as though they are here with us. I think we will give them the feeling of complete presence at the convention. 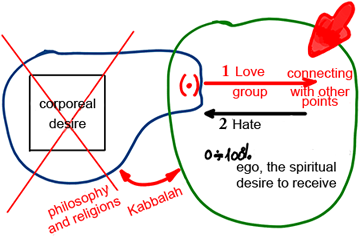 According to the wisdom of Kabbalah, the “body” of the Partzuf is called a desire to receive in order to bestow, and the “soul” is the Light that fills it. In order to acquire a soul, we are building a connection between us, which means that we make a desire to bestow from the desire to receive. In order to do that, we connect with the group above the ego, give up the desire to receive, and turn it into the opposite use; thereby the desire to receive works in order to bestow. The switch from the ego to bestowal is done by the Creator, I obligate Him to do so by my work in the group, in the environment, like it says: “My sons have defeated me.” He operates on me and then my desire to receive can work in bestowal. Accordingly, I now treat the friends this way and we establish the connection among us by building forms of bestowal from the thickness of the desire to receive, which turns it into the purity of the desire to bestow. The desire to receive is divided into five layers of “thickness,” from the root phase to phase four, and there is also a “spiritual embryo” in it, a point in the heart (•) that constantly evokes me, “shakes” me. In order to fulfill the “point in the heart,” I enter the group and summon upon myself the Light that Reforms, the Surrounding Light. First it performs “the first restriction” in me, according to which I cannot take my desire to receive into account. Then I can even work with my desire to receive in order to bestow, not in thickness but in purity, which is also divided into five levels. Accordingly I acquire five Lights: Nefesh, Ruach, Neshama, Haya, and Yechida, from the bottom up NRNHY. Thus my desire to bestow is formed by the desire to receive that was in me before. This desire to bestow is called “a vessel for the soul.” Why for the soul? 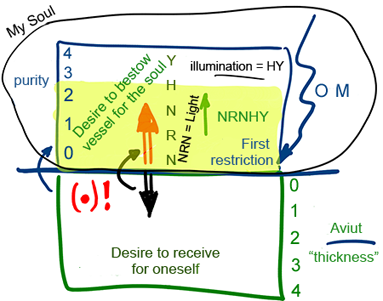 Because up to this level we receive the Light regularly, by using the thickness of the root, the first, and the second phases (NRN), while the Lights of Haya and Yechida cannot receive the Light regularly and so they reach us only as an illumination (HY). So the vessel of the soul is the purity of the desire to bestow, and the Light that fills it is called the Light of Neshama (the soul). On the whole, it is my soul that gradually turns my entire ego to its side, to purity. This means that the desire to receive doesn’t disappear, but we only change our use of it. In the News (from NewScientist): “Structures in the sun’s corona indicate that the peak in our star’s latest cycle of activity has been and gone, at least in its northern hemisphere. …The southern hemisphere, meanwhile, is on a sluggish rise to solar maximum and may not hit its peak until 2014. “Such a large asymmetry between hemispheres could be a sign of big changes ahead, says Steven Tobias, a mathematician at the University of Leeds, UK, who models what drives the sun’s magnetic field. According to his models, such a situation precedes an extended quiet phase called a grand minimum. ‘Changes in symmetry are more indicative of going into a grand minimum than the strength of the cycle,’ he says. Are We Moving Towards Climate Catastrophe? Opinion (Daniel Innerarity Grau, Spanish philosopher and lecturer in philosophy at the University of Zaragoza, Spain): “Power is the ability to define the situation, that is, to impose, by force and manipulation or argumentatively one’s vision. … In the EU, all the members participate in that. “The euro crisis has caused break up of the weak union that was formed around certain shared goals and equally shared fears. But this union was fragile and yielded to the powerful voice of some states. …There is no solution to the institutional crisis of the EU until all the member states become convinced that they are not autonomous, but interdependent and hence are obliged to cooperate as a whole. …. “The European Union is a real challenge to the idea that a national state is the only form of political community and identity. A uniform national identity is not a requirement either for democracy or for solidarity. … The European democratic experiment is precisely an attempt to share rights and responsibilities, costs and benefits, but without the guarantee of a national interaction of the old style. “Consequently, Europe is established not only through institutional reforms, but also through shared practices. … Governments have to end up accepting, however reluctantly, the fact the European Commission will have more power. During our studies of the wisdom of Kabbalah, we shouldn’t pay attention to how much we understand in the books of Kabbalah. The Sefirot, Olamot (worlds), and Partzufim aren’t important because we still haven’t attained the spiritual worlds and don’t know what is going on there. We are just juggling words. However, the work in the group is first and foremost; the connection between us leads to the correct studies in which we, like children, want to rise to the next level. Some kind of mutual desire for the next level attracts the upper Light onto us, the force that develops us. It develops us to the same extent that we yearn to be above. That is the only law of nature. Thus, we need to operate within this law and not forget that we unite and connect in order to discover within us the connection between us and the upper world, the Creator, in at least at the initial, minimal manifestation. The great students of Rashbi, before they began to describe their feelings and the discoveries in The Book of the Zohar, felt such a great hatred between them that they were even prepared to burn each other. This means that they were at such a high level of attainment where the left line, their ego, manifested in such a terrible way. We need to grow a lot in order to reach this. Thus, before us there lie many more great trials, and if we aren’t ready for them in the correct manner, then we simply will leave this way. Some of our friends have already left the way, and more are likely to drop out. Thus, we must always remind each other that we are involved with the Creator who gives us all kinds of states and determines all the relationships between us, along with the hatred, and if we ask, also the love. The main thing is that the group must take upon itself the commitment to remind each friend before the lesson about what to concentrate on. What was discovered today in our relations concerning one another? Apathy? That’s good, and tomorrow it can be that we will reach such a state where we will begin to feel rejection for each other. This means that we understand that everything comes from the Creator, that purposefully He reveals our ego and the intellect within us! Just a small person is given small opportunities so that he won’t deviate from his path. This means that there will be seemingly two states within us: one that is opposite to the Creator and the second that is similar to the Creator, and together they will stand facing each other, to be more precise, one under the other. Below, there will be the vessel, the Kli, that is completely under Tzimtzum Aleph (the first restriction), and above it, we will build the second vessel, Kli, the attribute of bestowal, and in this way, we will work with it. On the 13th of January, there will be the first global women’s convention. Our entire world group needs this special awakening on the part of the women. I am very happy that the women are enthusiastic and understanding regarding this special event. They are ready to do whatever they can, and I hope it will bear fruit. I advise every woman who can come from overseas and from Israel to register, and not to miss this meeting. The registration ends on Wednesday January 9th. We expect this convention to be a great ascent that will provide all of us with a new deficiency. In every family, the woman “fires up” her husband, and we want that this flare up to be a million times more intensive and that a real burning fire of desire aimed at the goal will surround us. The women are ready and able to do that. On the whole, a purposeful woman is more than 90% of the success. It isn’t by chance that we say that behind every successful man there is a woman. It is true. Here in spirituality, it is 100% true. I can hardly imagine a man’s success along the spiritual path without female support. So, why do we need all these hardships if we can connect according to the law of root and branch? It is written, “A man and a woman—Divinity between them.” The connection begins in the family and continues in the group, and it reaches the connection with the Creator. So, eventually, we will resemble Him as one image of one man.